One year passed already by since the first seedlings were planted by Pangaea members. Accompanied by professional advice, Pangaea Volunteers planted seedlings with so much energy, manpower and passion in July 2016. This year, some of us expected the old field full of young trees, protected by the shade of the fast-growingprimary trees. Green wherever you look. The good news first: the rainforest will cattily come back, though, it might take longer than expected. The grass has become problematic, it grew on the reforested area and thus took many nutrients out of the soil. This actually happened, because too few people were looking after the freshly planted seedlings once the project was finished. Maybe one would call this failure. But quite the contrary. First we are learning from past mistakes. Second the project was a great success as it triggered tree planting projects this year and hopefully many more in the future. 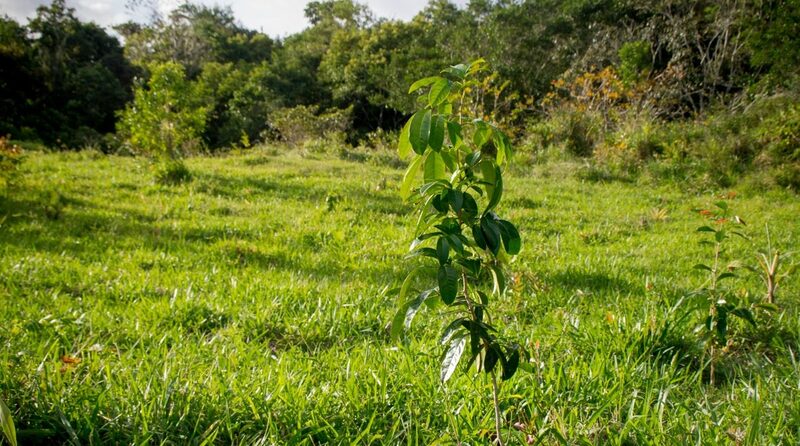 Additionally, the reforestation is now coordinated by AMAP (Almada Mata Atlantica Project) and accompanied by a professional team throughout the year. We are happy to be part of a follow-up project and hope that all the many areas will grow as fast as currently imagined.